I know that some of you have faithfully following along on our adventure this year, and might have noticed that there was now “Week 27”. I am afraid this week was dedicated to getting ready for the road trip that will carry us thru the bulk of the balance of 2018. Our 5th wheel needed some maintenance work, a couple of small repairs and a couple of major upgrades. This pretty much wiped out birding for the week. So, we move right on into Week 28, and we have hit the road. First stop was a tour of the many small lakes that run along the east side of the Cascade Mountain Range, in central Oregon. Just south of this area, and where we are headed in a couple of days, a huge 50,000 acre forest fire has broken out, so the threat of smoky conditions was looming. The drive over the pass was pretty gloomy, and we were a bit concerned about having to go to plan “B” if this was as bad as it was predicting. We parked the RV in Big Pines RV camp, in the little town of Crescent, Oregon, and hoped for a favourable wind over night. Bright and early the next day we were up, to clear blue skies, no real smoke, but a little chilly at 28 degrees F. We hit the road for our tour of a bunch of beautiful high mountain lakes. Wickiup Reservoir, Little Cultus Lake, Cultus Lake, Lava Lake and Davis Lake were all on our route, a loop of about 100 miles, 8 hours and 29 species. 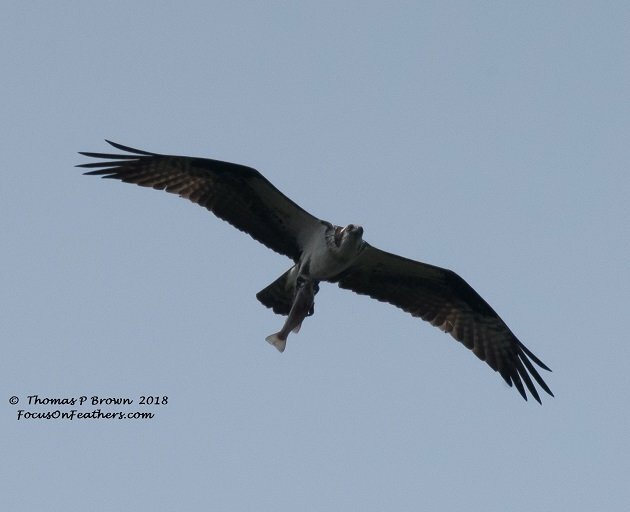 With all these lakes, full of trout, there is sure to be Osprey, like this one with this nice sized trout. 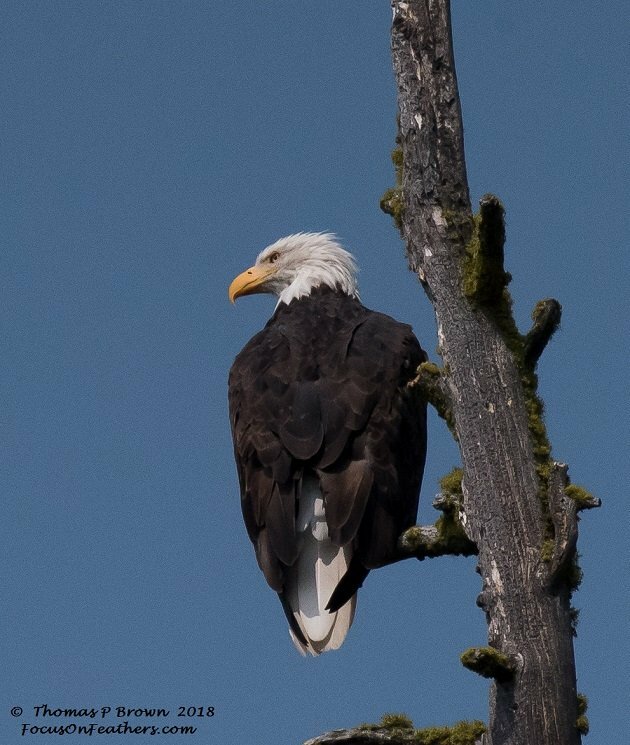 Another fish loving species, the Bald Eagle made an early morning appearance at Wickiup. 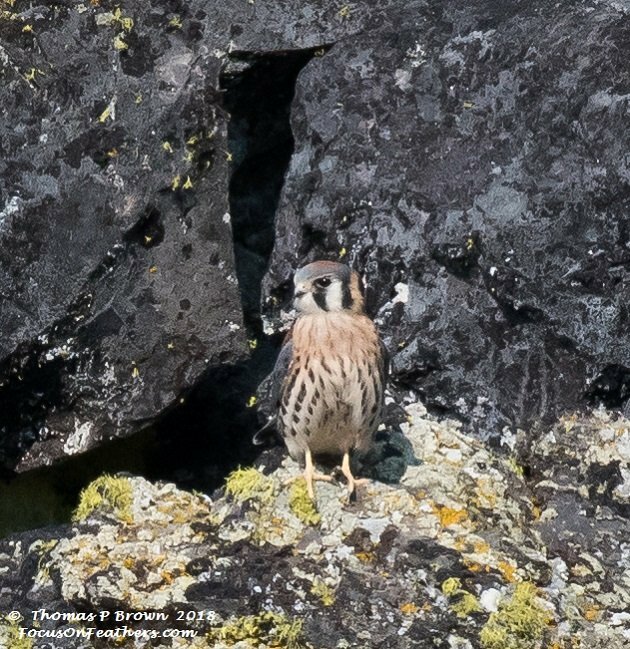 Near a campground at Davis Lake, I spotted this American Kestrel sitting in a lava flow. He flew out twice while we sat there to grab grasshoppers. 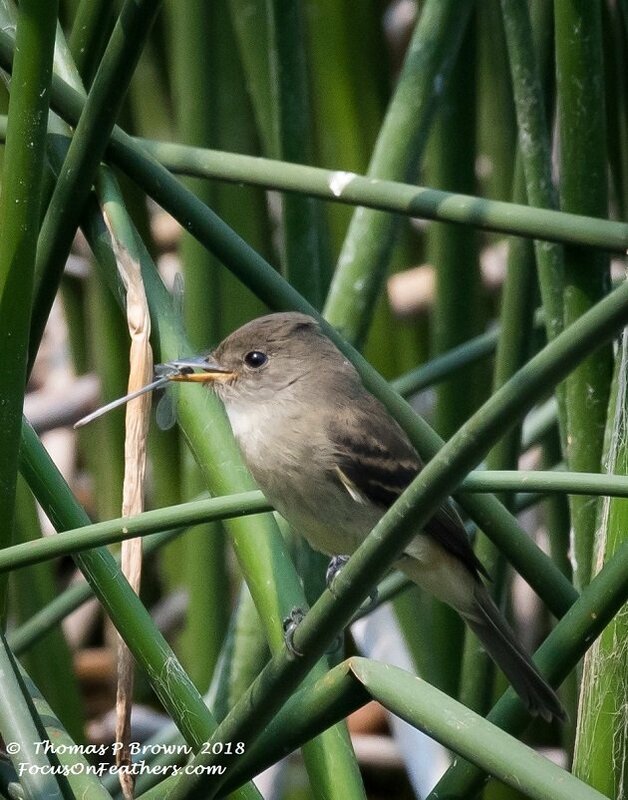 At Lava Lake, we found the large flock of Red-breasted Mergansers that are featured at the top of this story.At the boat launch, this Willow Flycatcher was hawking insects from the bull rushes. This damselfly was the victim I got to see while sitting there. 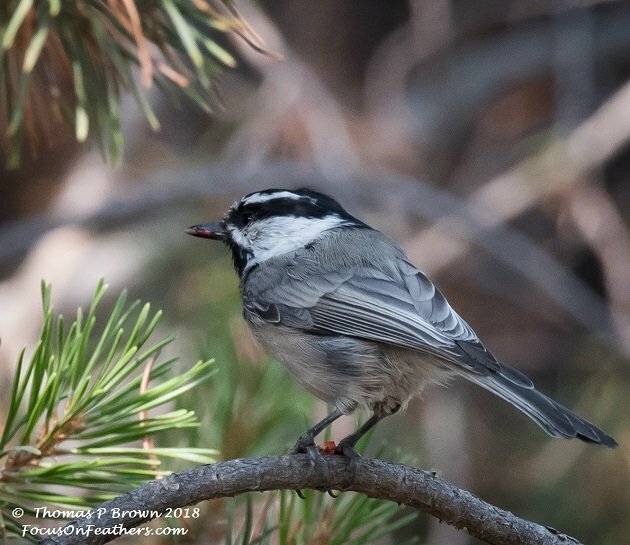 Once you get up to these higher altitudes, there are fewer Black-capped and Chestnut-backed Chickadees, and more Mountain Chickadee like this one. Note the strong white eyebrow. 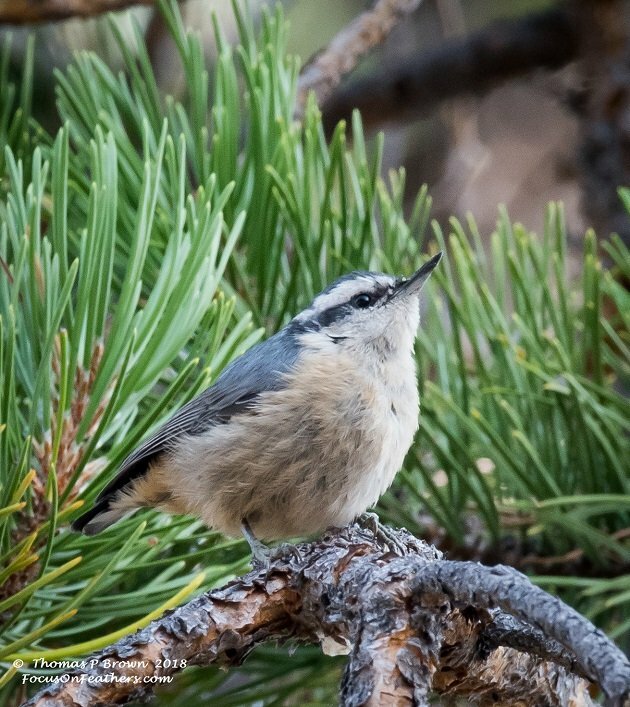 There seemed to be a large number of Red-breasted Nuthatches around our RV, and after returning from the drive, I saw why. The managers had several bird feeders out, that was keeping them well fed. 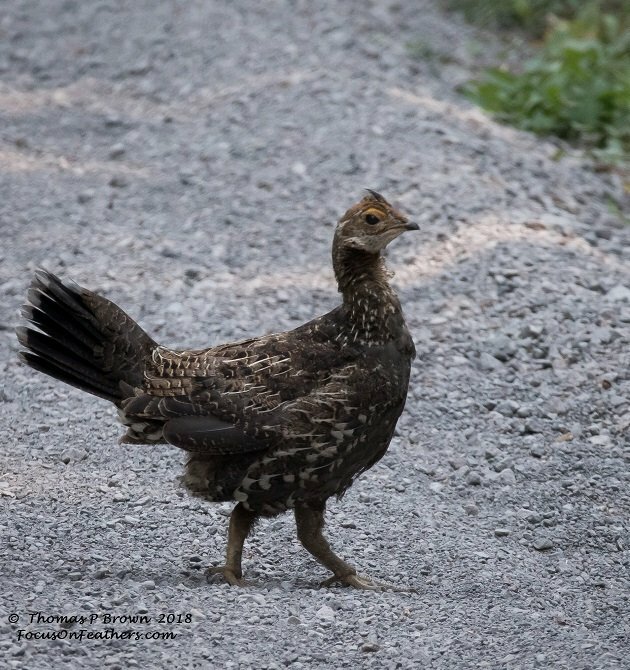 Without a doubt, the biggest surprise of the day came when four Sooty Grouse, a lifer for me, walked right in front of us, near Little Cultus Lake. 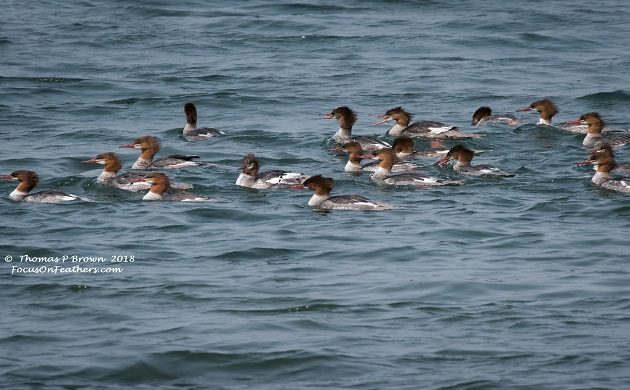 I am a bit behind on my eBird.org reports so I will have to get you the running numbers next week. This should have me at about 840 birds for the Little Big Year. Next week, Crater Lake, one of the true natural wonder of the state of Oregon.